This registered cover was sent from Guastalla. and about 60 km south southwest of Verona. Victor Emmanuel III stamps from the early 20th century. and a 25 c. blue (Scott 54, 112, and 101). There are four Guastalla CDS. The bottom is REGGIO EM[MILIA]. about 15 km west of the center of Montreal. Pointe Claire is an arrondissement of Montreal. The Canadian site uses borough as the translation of arrondissement. 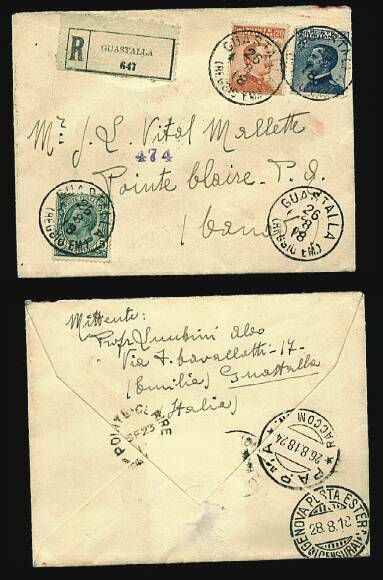 The route the cover took is indicated on the reverse. was backstamped the same day as it was posted. where it probably was carried by a steamer bound for North America. It passed through Genova on August 28. The next stop was September 23 in Pointe Claire.